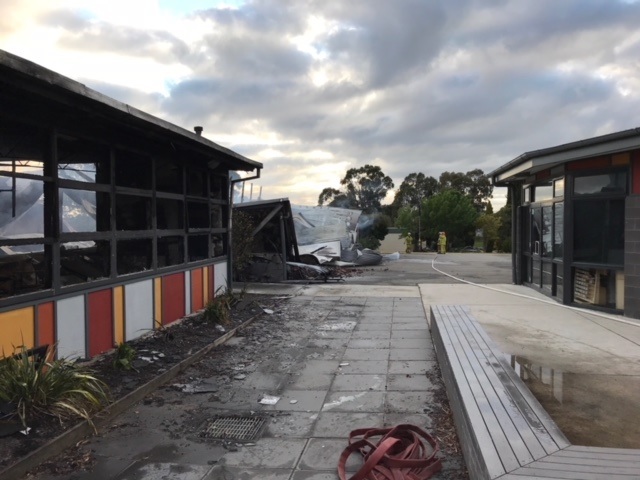 Ararat Rural City Council has offered support to Ararat West Primary School in the wake of last Saturday morning’s devastating fire. The aftermath of the Ararat West Primary School fire. Council staff have been in contact with Ararat West’s principal Terry Keilar throughout the week to provide what resources it can to support staff and students. Ararat Rural City Council Mayor, Cr Glenda McLean said help began immediately on Saturday morning when Council provided equipment at the scene of the fire. “We supplied two water tankers from our works depot to assist the CFA with bringing the blaze under control on Saturday morning,” Cr McLean said. “Our Municipal Building and Surveying staff visited the site earlier in the week and have been liaising with the various departments during the clean-up phase. Ararat West Primary School Principal, Terry Keilar said Council has also assisted with traffic management and the establishment of a temporary school crossing at Ararat College. “The outpouring of support from the Ararat and surrounding community has been overwhelming and Council is certainly included in that,” he said. “Particularly Council’s offer to use of the Community Bus at no charge so we can get students from the College to Ararat 800 Primary School for after school care services has been a big help. For further information and updates keep an eye on Ararat West Primary School and Ararat Active’s social media, including fundraising opportunities.